For the past year and a half I've seen every Yellow Tree Theatre production with a group of co-workers from our nearby office. The group changes in size and composition depending on the show and people's schedules, but we always have a good time at the theater (and the lovely and delicious Nectar Wine Bar in downtown Osseo). 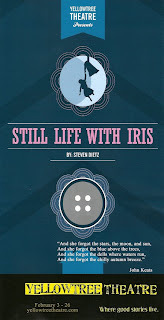 After seeing Still Life with Iris this week, my friends said to me, "I can't wait to read what you write about this because I don't quite know what to make of it!" I'm not sure I do either, but I'll do my best. Our heroine Iris is chosen to go to Great Island, which is not as great as it seems. 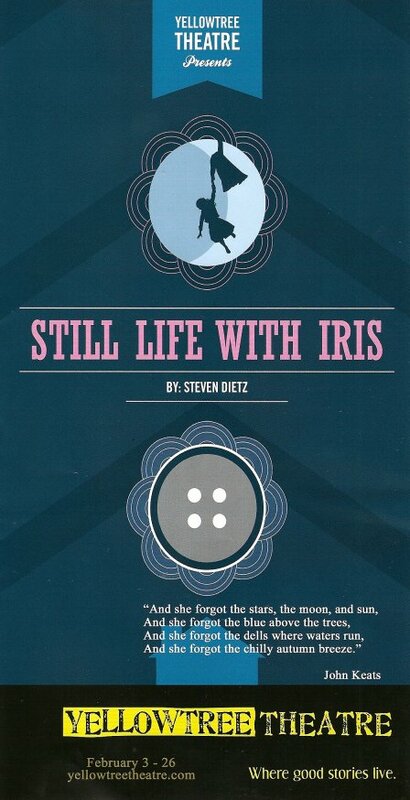 First her mother's coat is removed so she'll forget she ever had a daughter, and then Iris' coat is removed so she won't mourn for her own life. She's taken to Great Island to be the daughter of the Goods, who have one perfect specimen of everything. Hence they only wear one shoe, one sleeve, one eyebrow, in a delightfully asymmetric world. But Iris is a special girl, she knows something is off, something existed before she got to this island that she can't quite remember. So she escapes, and is aided in her attempt by none other than 18th century composer Mozart (whom she affectionately calls Moz) and the fictional Annabel Lee, from the Edgar Allen Poe poem. They manage to escape and find the lost memory coats, and Iris returns home to the life she loved and remembered. If I were to try to make sense of this wild ride, I'd say that we need to actively hold on to our memories, our past. Not just our own past but our family's past. Like in the genealogical show Who Do You Think You Are (Fridays on NBC), in which celebrities search for their ancestors' stories, we need to remember our collective past in order to live our best present. My great-aunt recently passed away, the last remaining member of her generation, leaving behind a treasure trove of stuff in my great-grandparents' house. I feel like I've found a few lost buttons and threads of my coat, looking around in that beautiful, run-down, stuffy old house. As always, the cast features wonderful members of the Yellow Tree family (for that's what it feels like). The director, Andy Frye, has himself appeared on stage in Miracle on Christmas Lake II and [title of show]. The always captivating Mary Fox plays Iris, giving her childlike strength and wisdom and curiosity. She's a hero we can root for. I'm not quite sure why Mozart is there, but I'm glad he is, with his Austrian accent and oversized keyboard. Yellow Tree newcomer Nathan Surprenant is a natural charismatic presence on stage and I look forward to seeing more of him. Molly McLain gives a delightfully wacky performance with a Cockney accent as Annabel Lee. Doree Du Toit plays Iris' mother; she has the role of the mourning mother down pat, having played a mother who loses her daughter in Steel Magnolias and Our Town. Our favorite nerdy stereotypical Minnesotan couple from Christmas Lake, Carolyn Trapskin and Ryan Nelson, are reunited here as Mr. and Mrs. Good. Their characters are just as quirky but much more evil. I was particularly impressed with Carolyn's ability to gracefully maneuver in her dress with a long side train while wearing only one high-heeled shoe, and with her maniacal laugh. The show has a wonderful look. Yellow Tree regulars might do a double-take when they walk into the theater, as I did. The stage is on the opposite side of the room, and the curtain dividing the stage from the lobby is gone, making room for the two story set with lots of stairs and doors and windows to play with (set design by Katie Phillips). The costumes by Sarah Bahr are adorable (striped socks and colorful patchwork sweaters in Nocturno), sleek (the Goods in their stark, asymmetrical black), and whimsical (Annabel Lee's fairy-like layers). I'm not sure how well I did in making sense of this play, but I'm not sure sense is what it's about. It's more about the feeling that's created. And as always at Yellow Tree, it's a good feeling. Their next production is one of my favorite plays, The Glass Menagerie. Unlike musicals, I don't have a lot of favorite plays (it's pretty much The Glass Menagerie and Tom Stoppard's Arcadia), so it goes without saying that I'm looking forward to it!